If you are a busy woman who has little to no time to spare, then hair rollers are a good solution for you. Glamming and styling your hair while you sleep, freeing up your time for work and kids. But these tools are all but extinct other than in the realm of red carpet and runway beauty. Find out how you can get those glamorous curls that one sees only on A-list celebrities and runway models. The first step is choosing the right rollers. You can get rollers of different sizes for different looks - small rollers will give you smaller curls and large rollers will give you softer, wavier curls. Huge curlers don’t actually curl your hair; they simply add volume and make the ends of your hair to curl inwards. These rollers will work only if you have hair that is at least medium length or shoulder-length. If you have thin or damaged hair, then you might want to stay away from hot rollers as they could cause further damage. Generally speaking, each hair curler should stay on a portion of your hair to that same size like the rollers, and that’s whatever thickness or texture your hair is. If your hair is frizzy, then felt rollers are a good option for adding smoothness and shine to your hair. The number of times you wrap your locks around each roller also plays a part in defining your curls. One and a half wraps will set a C-shaped curl and two and a half wraps will set your hair to an S-shaped curl. Why Straighten Your Hair Before Putting in Rollers? Once you have the rollers you want, the next step is to straighten your hair. This may sound counter-intuitive, but if you straighten your hair, then you will get curls that are smooth and uniform. One way to go about this is to apply setting mist to your hair. If your hair already has product in it from the previous day, then a little water goes a long way in resetting it. It also doesn’t hurt to use a blow dryer to help in straightening it before putting in the curlers. The next thing is to preheat hair curlers to an optimum temperature. It is usually enough to follow the instructions provided by the manufacturer but in some cases, you may want to conduct an experiment to your hair with a few different temperatures to find out what works best for your hair. In general, small rollers preheated to high temperatures will give you tighter or spiral curls, while larger rollers preheated to low temperatures will give you softer or looser curls. Before putting in the rollers, you may want to apply a thermal protectant product to your hair. This will assist in protecting you from hair damage caused by heat while also keeping your curls set for a longer period of time. Just remember to distribute this product uniformly on your hair only once when it is completely dry. Now it is time to put the rollers in. To do this, you will have to take a portion of your hair and roll it through the head. The size of the section will determine the overall look of your curls – and again, larger sections will give you looser, wavier curls, while smaller sections will give you tighter or kind of spiral curls. You can even use clips to separate your hair into larger sections to make it easier to separate each section that you wish to roll. 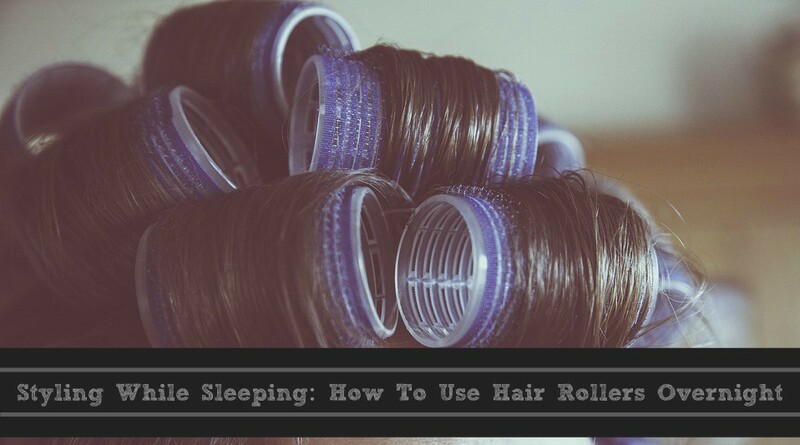 Once you have all the rollers in, all you need to do is go to bed! When you wake up, simply unroll your hair - careful not to tug at the rollers if they get stuck, just work them out as gently as you can - and run your fingers through your hair to fluff it up a little bit. One way to maintain your curls is to apply alligator hair clips to your hair once the curls start to loosen up. These clips can be annoying while you sleep, which is why it is probably better to apply them only at the top of your head. Putting in hair rollers before sleeping is the least time-consuming way to curl your hair and the results are fantastic! This method of curling your hair is regaining popularity among women who are juggling work and family. That is why we recommend that you visit The Hair Central for tips and tricks on how to use hair rollers. They review special curlers you can sleep in so that you don’t have to waste your time experimenting with products that don’t cut it. So what are you waiting for? Get yourself some hair rollers and say goodbye to bad hair days! I've never tried rolls but it sounds pretty awesome! I've never tried rollers, basically only use a curling wand but if I could figure out how to use them and it doesn't bother me in bed, probably better than using heat! This is all great advice, Kim. I've never actually tried using hair rollers before and so I'll keep your tips in mind should I ever in future. I'd never heard of straightening your hair before curling, how interesting! Love that you shared this Kim because I was actually looking on Amazon a few weeks ago for rollers and didn't know what brand to use. I've never tried them either (except maybe at a hair salon as a teen) and I'm always looking for a way to add more volume to the back of my hair so I would definitely try rollers. Have to be a little careful about the damage though since I have thinner hair. :) Tweeting this post now. This is totally making me feel nostalgic for my cosmetology school days, Kim! I swear I did so many roller sets it was crazy haha! I know that's a bit different than sleeping in them, but that is a great idea to save some time in the morning! I have never tried rollers. My hair could certainly use extra body. Someday I just need to give them a try! What a helpful post for a new mama, like me, who has little to no time these days! I've never slept with rollers before. In fact, it's been such a long time since I've used rollers. You've reminded me to pull them out (I have a lot of them!). Thanks for sharing, gorgeous, and I hope you have a great week ahead! I think I still have a thing of velvet hair rollers that are in this stand that heats them up! I haven't used them in years though. I usually use my curling wand.